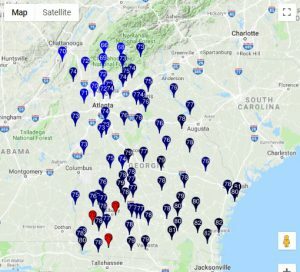 I don’t usually take the time to brag about the UGA Weather Network, a network of 86 weather stations scattered around Georgia taking high-quality weather measurements which are used by a variety of groups, including the National Weather Service, media outlets, and many agricultural producers as well as university scientists. But I am proud to be the interim director, and I think you should know what a fantastic job they did in monitoring Hurricane Michael as it passed through Georgia yesterday and this morning. While the system did not work perfectly due to some temporary network issues caused by power outages (and the fact that we don’t run a 24/7 operation due to limited personnel), by and large the weather monitoring done by the network was flawless and used by a number of groups, especially after many of the National Weather Service sites stopped working as the storm moved through the area. As of this morning, all but three of our stations are online and operating normally. We are working to fix those three stations but at this time we are not sure if the cell antennas blew off the stations or if cell service in the area is disrupted due to power outages. Unless the instruments blew off those stations, we should be able to recover the full datasets from those stations once communication is restored. Every other one of our stations is taking observations as usual. The National Weather Service specifically mentioned to me how much they appreciated being able to use our network data to monitor the storm conditions when their own stations went down. They noted that the Donalsonville station’s gust of 115 mph will likely be included in the final storm report put out by the National Hurricane Center. I also noticed that a wind gust from the Arabi station was mentioned by David Chandley in his evening broadcast. I attribute the overwhelming success of the network to a combination of factors that includes both equipment and personnel. The Campbell Scientific equipment came through the storm with very few problems. Using solar panels limited disruptions due to power outages, which are widespread in the counties along the path of Michael’s center. In addition, the support people who keep the network running did an outstanding job of working to take care of problems as soon as they happened. 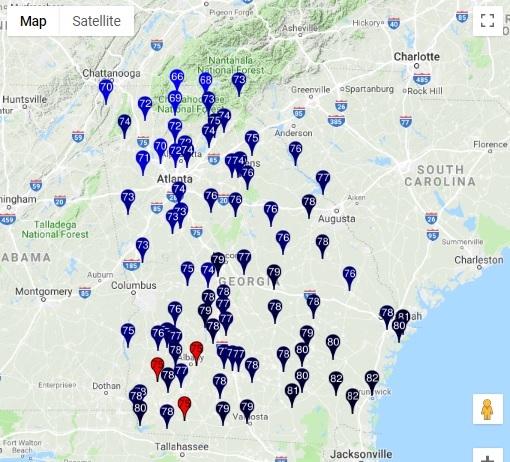 If you live in another state that also has a mesonet, be thankful for the hard work that the technicians and IT personnel put in to make useful data available to you in a seamless way. This also goes for the National Weather Service meteorologists and hydrologists, emergency managers, utility workers and other personnel that work hard in difficult conditions to keep us safe. They all deserve a round of applause today for what they have done to get us through the storm. Posted in Sources of weather and climate data. Bookmark the permalink.